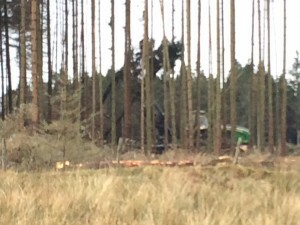 For me, this point was, sadly, almost as soon as I stepped off the pavement alongside the A68 in Byrness this morning. Yes, my Gore-tex boots and Gore-tex socks, leftovers from LEJOG in 2014, are now about as waterproof as colanders. So I hiked the entire 26 miles with soaking feet. There was not one inch of the path that was dry. Water, mud or slushy snow up to the lace-holes of my boots – or deeper – at every single step. Quite the wettest walk I have ever done – and wetter even than the summer of 1977 when I last passed this way. With everyone I met knowing that I was about to embark on a winter crossing of longest and almost certainly the toughest day of the PW, I was naturally bombarded with lots of helpful advice. The most useful advice I got was, actually “don’t stop” and “eat constantly”. Although difficult to execute simultaneously, they are both helpful. Not stopping is sensible, as if you do, you get cold almost immediately. So if you are going to stop for any length of time, you have to pile lots of extra clothes on, and then take them off again as you stagger back onto your seized-up limbs. And eating goes without saying. You burn a huge amount of energy on a walk like this – especially when the going is so hard – and if you don’t eat, you will become exhausted probably without noticing it and become much more prone to accident. So I ate and walked and ate and walked. I never stopped and sat down, and in total I think I probably only paused half a dozen times, for no more than five minutes each – mostly just to get a hot drink from my Thermos. Syrup sandwiches (you should try them one day) on a currant bun were my mainstay – easy to eat, full of energy, and decent texture. 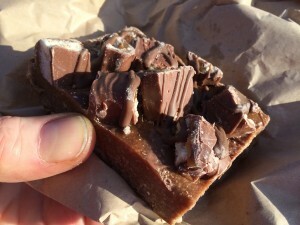 Almost as good as millionaire’s shortbread, in fact. And the most unhelpful advice? Well, I was told by someone that “you will find it much easier than 1977 because a lot of the Way has been paved or laid with boardwalk now”. This is unhelpful because it is simply untrue. OK – much of the 8 mile section from Windy Gyle to Auchope Cairn has been paved, but almost none of the remaining 26 miles has. And the paving, where it has been laid, has been placed either by accident or design at below bog-level. So in the areas where it wasn’t frozen, it became a natural conduit for water, and was submerged by several inches of icy flow. And in the areas where snow lay, it formed a natural indent for snow to drift and accumulate. In these sections the flagging was downright dangerous, as the snow made it impossible to see what you were stepping on, and carried the high likelihood that whatever it was would be covered in ice and liable to cause you to fall. So – grumbles aside, what was today’s walk actually like. Well, it was very long, and included thousands of feet of climbing. Just when you got to the top of something, the next mountain would appear in front of you. And the next, and the next, and the next. And all were covered in slush or bog. It was also very very very wet. I don’t think this place every dries out. Maybe if it didn’t rain for a decade, it would start to dry, but I can’t see that ever happening. 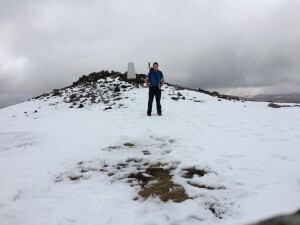 And the thick wet snow from Windy Gyle to the top of Auchope Cairn was eight miles of unmitigated exhaustion. Every footstep required three times the effort to push boots through the snow to an uncertain bottom, then drag them forward and haul them out again. It was exhausting work. At one point, I had to resort to counting my paces, and stopping after every hundred to catch my breath. Something I can only remember doing once before, which was when I was on an 18,000 ft walk in Nepal. 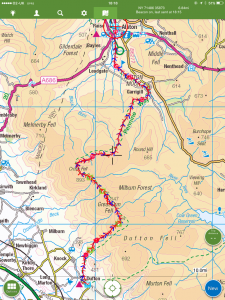 But towards the end, the terrain changed a little and the ascent of White Law was much drier – a perfect grassy hill which I imagine would be a delight to climb if it didn’t come after 23 miles of uphill slog. But on the positive side, the weather couldn’t have been better. After early mist and drizzle cleared, the day was largely dry and bright, with no rain and almost no wind. 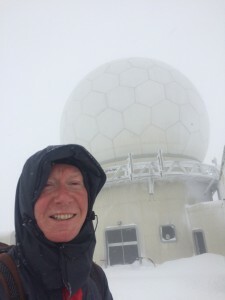 I count myself extremely lucky – if it had been wet or windy – which actually is the norm – it would have been very hard going indeed. And the views were spectacular! 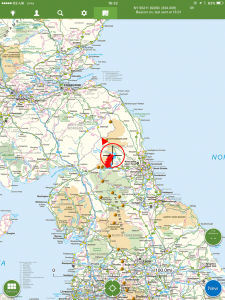 Although still subject to the “whump – boom” of shelling from Otterburn, mostly it was dead silent up there. I only saw three people, a lot of sheep, and four feral goats all day, so I had these amazing panoramas all to myself. Absolutely magical. So it was a fitting end to a brilliant walk. A magnificent crescendo of toil bringing me right into Scotland. I loved pretty much every minute of today – despite the pain – and of the whole walk. So this time if someone asked me “Did you enjoy it?” and “Would you do it again?”, the answer would be an unhesitating “Yes and Yes!”. 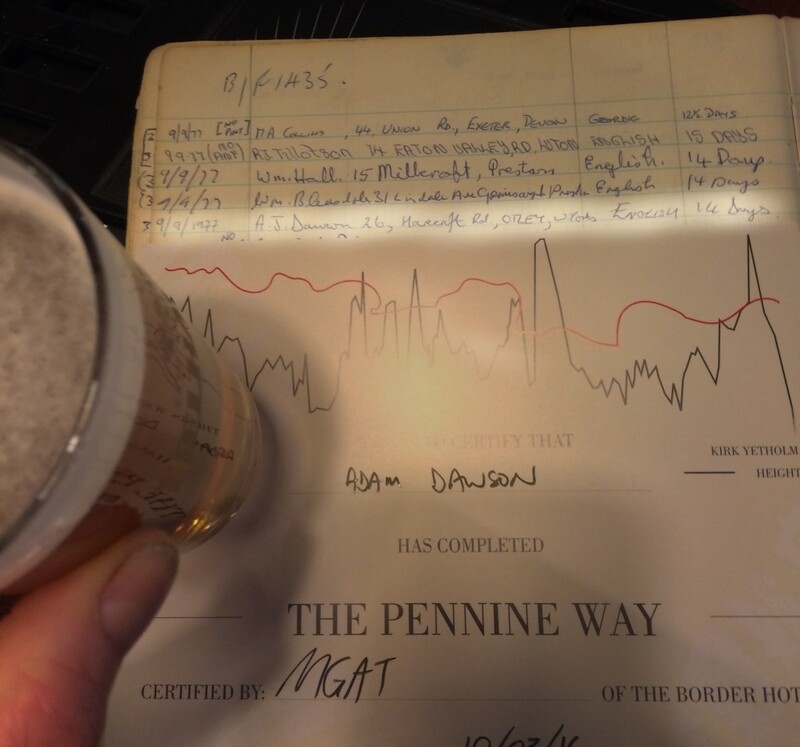 Well, now I’m going to sign off from the Pennine Way and head over to the Border Hotel to claim my free half pint courtesy of Mr Wainwright. So long, it’s been a blast (as they say in Otterburn)! Someone up there was smiling on me today. I had excellent weather – no wind, a little sun, and no rain. Couldn’t really have been better Nothing will wipe that grin off my face for two days at least. Just when you have had enough, after 18 miles you discover that there are these four giant bog-filled Tunnocks teacakes still remaining to be scaled. Absolutely the last thing you want to see! After I’d finished hiking, had something to eat and a shower, I went to the Border hotel to collect my free beer courtesy of Mr Wainwright, and my certificate. And I also checked out the PW logbook for 1977. So much better this time! At the end of every day since Keld, with the honourable exception of the day on Hadrian’s Wall, my boots have been wet. Not damp, but sodden, wringing wet. The sort of soaking wet that means that small foamy bubbles ooze out of the seams as you walk, causing them to hiss and fizz with boiling wetness. This causes a dilemma. When you arrive at your night’s destination, you are faced with a choice – to dry or not to dry? Everyone’s natural reaction is, of course “to dry”, and I must admit that has normally been my choice. This means either asking the proprietor of your lodgings if they would mind putting your dripping wet, filthy, stinking boots somewhere warm, like perhaps their airing cupboard, to dry out for the night. Or secreting them into your room and putting them on top of the radiator to dry. If you haven’t suffocated in the night, your boots will be warm and dry in the morning. 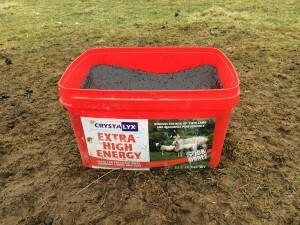 This sounds like a bit of a no-brainer, but drying your boots brings with it a downside. Through the process of drying, your footwear becomes crispy and rigid – in fact as tough as old boots. Because, literally, that is what they are. This makes them very uncomfortable to put on – a bit like wooden clogs with spiky bits where the disintegrating interior has dried out and hardened, and which will stick uncompromisingly into your feet. Last night, I opted for the dry route and sure enough my concrete footwear was produced, warm and dry, with great forbearance by my landlady this morning. So I slipped them on, feeling a bit like Cinderella’s ugly sister who had to cut her toes off to get the shoes on. And to my great disappointment, within a mile or two I felt chafing on my right foot, and by lunchtime it was so bad that I stopped to take a look. And sure enough, the rigid boot had caused a blister to form on my heel – my first, actually, of the walk. So the moral of the story is – contemplate before you desiccate. Footwear problems aside, the walk was rather like yesterday, but actually a bit more enjoyable. The hills were a bit higher, the path a bit less farmyard-y, and the views a bit more expansive. I felt I had a bit of a spring in my step – despite the blister, and made good time today. I actually found the going a bit drier than I expected too – but there was a good reason for this. Normally, when people offer me sage advice about how the next stage of whatever I am doing is both difficult and in their experience dangerous, and I really ought to do something else, I ignore it. This is on the basis that it is usually either wrong, or given in the spirit of demonstrating that while they were heroic enough to complete whatever it was that you were about to do, you probably are not. But sometimes, you get advice that you just have to listen to. And that happened today. 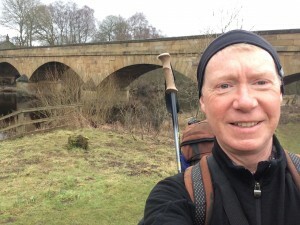 A friend of mine, Richard, who completed the “LEJOG” hike a year after me, followed the Pennine Way for part of his route. 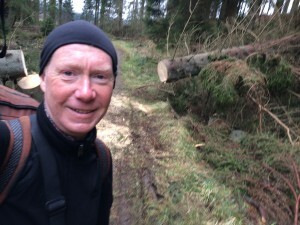 He emailed me to tell me that the couple of miles on the Pennine Way through Rumblingsike Bog, which I planned to traverse today, were the worst two of the whole 1,500 miles he walked between “LE” and “JOG”. 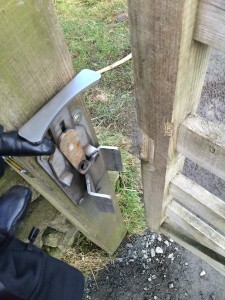 In fact he said that this was the only point on the whole of his hike where he actually feared for his life. He strongly advised me to avoid it, and take a route to the west, up a forestry track, that he only learned about after the event. Given that Richard has nothing to prove, and neither do it, I unhesitatingly took his advice, and added a “dog leg” to the forestry track from the main PW, neatly sidestepping the notorious Bog and keeping dry (ish) feet. 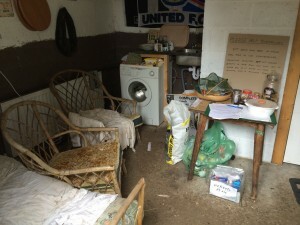 If you want to read Richard’s graphic account of the bog, then click here. So now I’m in Byrness, contemplating the Cheviot. It feels a bit like this is what the whole walk up to now has been about. 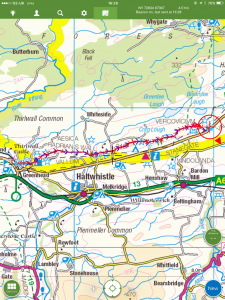 The section from here to the end at Kirk Yetholm is without doubt the hardest of the whole Pennine Way. The real scorpion’s sting in the tail. 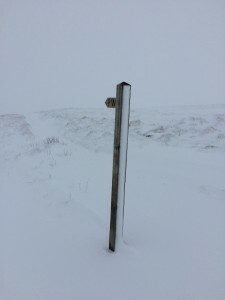 It’s the longest section of the walk – at 26 miles at least, and involves the most climbing – around 5,000 ft. Also, I know there’s a lot of snow up there – I met a couple of walkers today who had been up on the Cheviot a few days ago and experienced waist –deep snowdrifts. So, it’s a toughie. I’m planning to make a very early start tomorrow – I have set the alarm for 5 am and want to be away before six. Sunrise is about 6:36 and sets again at 18:03, so I should have over eleven hours of daylight, and hopefully only need the head torch for an hour or two at most. BUT! I have a fallback plan. 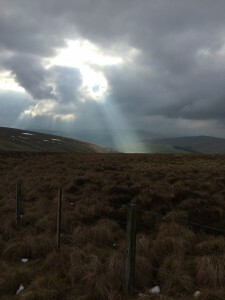 If the going is too tough, or I run out of daylight, I will drop north west off the ridge just beyond Windy Gyle, and head for Cocklawfoot. The B&B proprietor from Kirk Yetholm has agreed to pick me up there, and return me the next day to finish off the job. So I hope tomorrow is the last day, but it may not be. It’s all down to man vs. mountain. Check this blog tomorrow to see how I got on! Setting lut this morning. Bridge over the river Rede in the background On the top of Millstone Edge. Feeloing remarkably chipper! Typical hilltop scene today – near Whiteley Pike Pennine Way sign (to the right) looking a little forlorn today – the gravel forestry track is such a more appealing alternative! At this point (looking back along the way I’d come) you can either take the left fork into Rumblingsike bog, or the right fork down the forestry track. If you go left, you might never be seen again. Tom Stephenson (not you Tom – the one with the “ph”), the Pennine Pioneer, would have been justified in thinking, when he arrived at Alston in the early 1960s: “Yes, that’s a good piece of work. 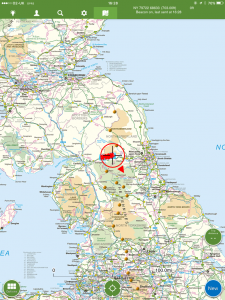 I have created a continuous right of way all the way from the southernmost Pennines, to the very northernmost. Here would be a good place to stop”. And who knows, if he had, the extra trade from visitors that a Way starting and ending at Alston would have created might even have been sufficient to persuade Dr Beeching go and wield his axe elsewhere. Mr Stephenson would also have been justified in thinking, if he were a Pennine Purist: “Alston isn’t quite the most northerly point of the Pennines. I will press on a bit further to include the hills of Croglin Fell, which might more justifiably lay claim to this title. 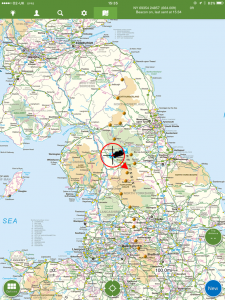 Then I will head over a few miles to Carlisle, a splendid city and a fitting end to the walk”. But he didn’t do either of these things. 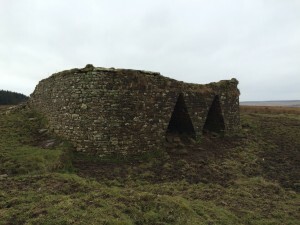 Instead, he decided to include the pleasant but unremarkable western flanks of the South Tyne valley in his walk, and then to reach Hadrian’s Wall. 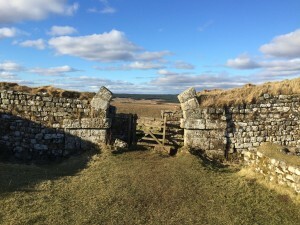 This might have been a logical course to follow, as Hadrian’s Wall is indeed an excellent destination, and Housesteads fort would have been a suitable climax to the walk. 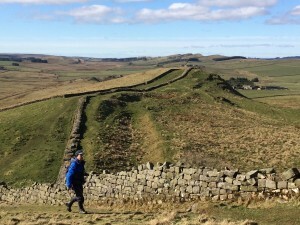 So it seems more than a little odd that the Pennine Way doesn’t finish at Hadrian’s Wall. Indeed, technically, it doesn’t even visit Housesteads, the most interesting part. Rather, it plunges north again, for a further fifty miles to its final destination. Many suppose that the motivation for this extension was to reach the Cheviots – the most northerly Hills in England. But their link to the Pennines is tenuous, and to reach them entails two days of walking through countryside which is at best unexciting and at worst downright dull. As a result, today I found myself embarking on the first day of a two day hike to reach the more interesting Cheviot Hills at the end. In every sense, this was a day without excitement. The weather was nondescript – overcast, cold, and drizzly. 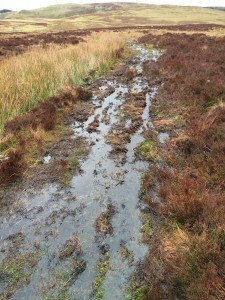 The scenery was wet, muddy and neither upland nor pastoral. Completely unmemorable. And there were no incidents along the way to bring life to the day. My over-riding memory was one of a landscape in humid brown, grey and green. A pastel vision, washed out by gloom and drizzle. The walk did offer one or two novelties – the first cows of the Pennine Way (luckily, just out of hibernation, they were much more interested in their silage than in me); the first extended forest; and the first fly-by of RAF Tornado jets. The latter, by the way, was accompanied by an intensification of the explosive earth indigestion that I’d first heard two days ago. 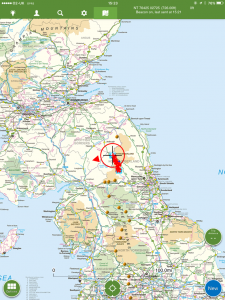 On further inquiry, I have been told it most likely isn’t testing at Spadeadam at all, but rather the sound of military exercises at nearby Otterburn army camp. At times the explosions were so loud they felt like they would make my brain rattle. Quite a sobering reminder, with the low flying jets, of quite how terrifying living in a conflict zone would be. Wargames aside, the walk was largely peaceful and quiet. 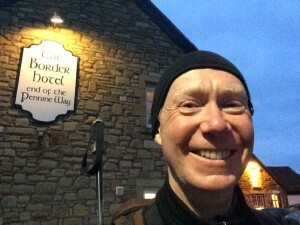 Once I left the Wall, I saw absolutely nobody at all until I reached the B&B this evening. With the lack of sensory inputs of any sort, I drifted into a bit of a reverie – at one point to such an extent that I forgot to check my GPS for a few moments and found myself heading enthusiastically but misguidedly up a valley which was going at ninety degrees away from the right direction. A detour which probably added quarter of a mile to my journey. So at the end of the day, I wondered if this was why Mr Stevenson had added these miles onto his route. It wasn’t to provide scenic spectacle, or even the achievement of some elevated northerly goal. Rather it was to allow for a period of reflection, an escape from the day to day pressures of life that most of us digest every day, a rare opportunity for quiet calm and contemplation. This was a typical scene today. A study in dull. Today was, without a doubt, one of those days that every walker dreams about. When you’re on a long distance hike like this, the first thing you normally do is to open the curtains and see what the weather is like. Obviously you don’t need to do this if you are camping, as you will know what then weather is like because it is usually leaking into the tent by this stage. But what you see through the window, or feel dropping onto your forehead, will to a large extent determine the quality of your life for the next 24 hours. And the sight through the window at Greenhead this morning was one of an icy dawn, with a bright wintry sun breaking into a clear azure sky. Your heart always skips a beat at this stage. “Can it be real” you wonder, so you have a closer look to make sure you’re not seeing things. But today it was real – the frost was hard, the sky was clear, and the trees weren’t bent into the wind. So it had all the hallmarks of a great day. And it was! Because not only was I walking today on mud which through the magic of frost had been transformed from squelch to crunch, but I was also on one of the most historically interesting sections of the whole walk. The icing(s) on my cake today were that the walk was going to be short – at ten miles, the second shortest on the whole walk, and because I would be joined by David, a friend I have known since early childhood. I needed an easy day with good weather to recharge batteries drained by the last few days, which have been tough and challenging. 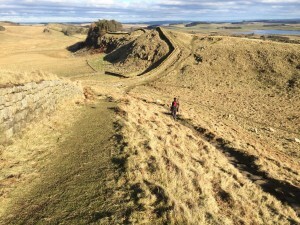 The reason for the historic interest is because this section of the Way runs alongside, or even along, Hadrian’s Wall. Stepping where the centurions had marched, two thousand years ago, was exciting. In my mind I found a strangely reassuring contrast between the changing tides of human fortune, as the Roman Empire came and went, and the timelessness of the scenery the Wall traverses. The wall sits on the top of the natural defensive rampart created by the Whin Sill, itself a relatively junior intrusion into the earth’s crust a mere 295 million years ago. Less than one tenth of the age of the earth. Although the walk was short, it managed to cram in a lot of the same sort of ups and downs that I’d encountered on the south west coast path in 2014. But the miles and ascent passed easily – today it was impossible to look in any direction and not be impressed by the view. The history, both natural and archaeological, was simply outstanding. It was one of those days when it was impossible to point the lens, and not to capture a brilliant new perspective. We passed milecastles and forts, marvelled at walls and vallums, and paused frequently to admire the view. And to my delight, David had managed to find some proper food in Haltwhistle, which helped dispel those awful memories of salad, and which we enjoyed while watching the late afternoon sun slowly becoming evening at Milecastle 37. We finished the walk at Housesteads fort, a beautiful spot, world renowned for its outstanding archaeology, fabulous views, and complete lack of a tea shop. But this serious omission aside, I did learn about the special European “dark skies” status that this part of Northumberland enjoys. David was telling me that last night the Northern Lights were visible from Lancaster, so as soon as I’ve finished this blog, and downed my drink, I’m going to finish the day as I started – with my head out of the window, gazing heavenwards, wondering what the omens the sky might reveal. Looking east from Winshield crags – highest point on Hadrian’s Wall. It felt like you ought to be able to see both east and west coasts of the UK from here – but not sure if you actually could. Squelch, squelch, squelch. Well, if every walk had its own theme tune, these are the words that would have to be incorporated into the tune for today. I’d been hoping for a “tedious” day, to allow a bit of recovery from the arctic battles of the last couple of sections. So with that in mind, I’d envisaged the walk today as a bit of a riverside ramble. 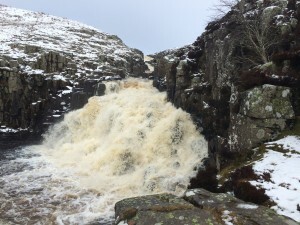 This presumption was based solely on the fact that the route headed north to meet Hadrian, and the river from Alston flowed in roughly the same direction. Actually, the day was quite hard going and definitely wasn’t tedious. And it wasn’t a riverside ramble either. 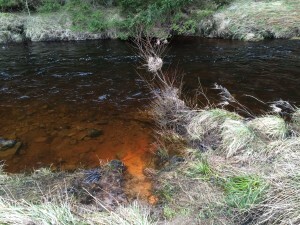 In fact, it didn’t feature the river at all. Rather, and if I’d only bothered to check the map yesterday I’d have known, it was a high level moorland walk well to the west of the valley. The path wasn’t well trodden – in fact for most of the way there wasn’t really a discernible path at all. 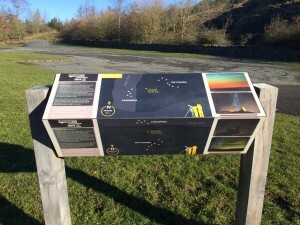 Just marker signs at field boundaries and near stiles. I realised later that part of the reason for the lack of foot traffic might have been down to the fact that running parallel to the Way, for a large proportion of the route today, was a partially disused railway line. The old line has been converted into a smooth, dry, flat track which I suspect a few walkers have seen as a viable alternative to the “real” way, saving miles, hours, and energy. 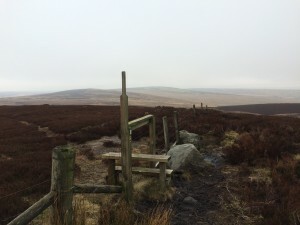 Although the easy option has tempting, I avoided it and stuck to the purist moorland trail. 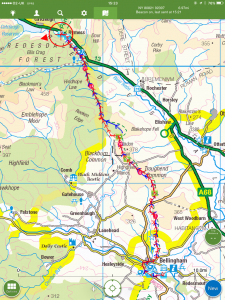 I learned, by the way, that the old railway line has been partly restored as the narrow-gauge South Tynedale Railway, running from Alston to Kirkhaugh. It has recently been awarded £6m of lottery funding, with plans to re-open the line right through to Haltwhistle. The weather was exceptionally benign today, and at one point I could actually feel the warmth of the sun on my back. It was hard to believe that I was only a few miles and 24 hours away from the blasting blizzards and freezing cold of the previous days. I encountered no snow at all, though the Pennines behind me were clothed in white, as were the distant Cheviots just visible to the north, beckoning me on towards the end of the walk. As I walked, I became aware that every half an hour or so, I’d hear loud rumbling sounds of distant heavy explosion coming from the north. They lasted all morning and I couldn’t figure out what they were. It almost sounded as if the earth itself had indigestion. 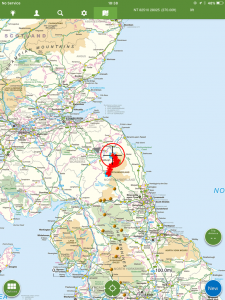 I asked the man in the pub this evening about them and it turns out they were most likely coming from the DNV GL Spadeadam test site, a few miles up the road from here. Apparently they blow up houses and trains to see what happens to all the bits. But no – my abiding memory of today’s walk isn’t the weather, the scenery, or the explosions. It was of the mud, the bog, and the ankle deep water standing on the path. I think that every single footstep today ended in “squelch”. Eighteen miles of wet. None of the luxurious paved walkways of the southern sections of the way, just an unadulterated morass of sticky quagmire. 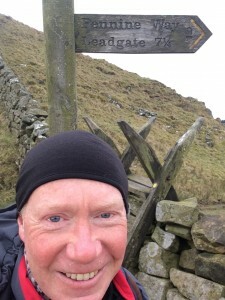 A true reference point for Pennine Way Classic. I can’t imagine that this section ever dries out, and I have an uncomfortable suspicion that there could be more of this to come, as over the next three days I span these lower-lying regions between the Pennines and the Cheviots. Putting the wet to one side, along the way I enjoyed far reaching views in all directions. 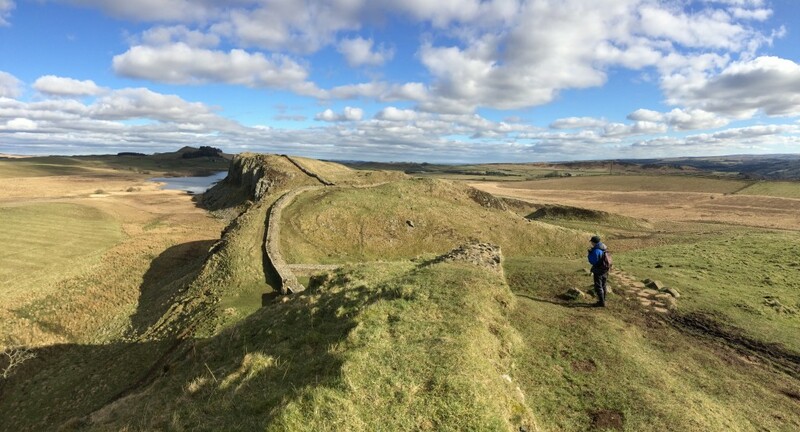 Towards the end, as spirits were beginning to sink a bit, exhausted by squelching, I spotted to the east the Great Whin Sill – the hard basaltic intrusion which forms the uplifting foundation for Hadrian’s Wall. 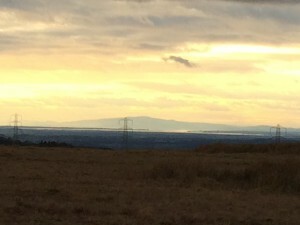 And in the other direction, against the setting sun, I was surprised to see the Galloway hills basking in the sun, way beyond the Solway Firth. Merrick, Corserine and the Rhins of Kells – all awaiting exploration on another day. By the end of the day today I reached Hadrian’s Wall – or rather the Vallum (ditch) which precedes it. I’m spending all of tomorrow walking on the Wall – which promises to be both scenic and historic. And at only ten miles, luxuriously short, too. Looking a lot more relaxed today Yes I know these are sheep but there are subtle differences, just like people. 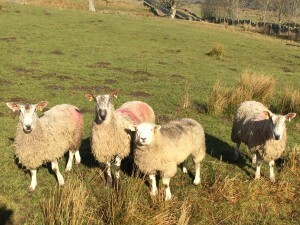 The one third from left is a Texel, but I think the other 3 may be Bluefaced Leicesters. But I stand to be corrected..
As I planned this winter Pennine Way trek from the comfort of my living room, I wondered what the biggest hazard I could encounter on the walk would be. I concluded that it would probably be “deep snow”. After all, I thought I could probably cope with pretty much anything else the Way might throw at me, except possibly cows. (And as an interesting aside – while cows were the biggest hazard that I came across on the “LEJOG” hike in 2014. I haven’t seen a single one on the PW. I actually think they may hibernate for the winter). But “deep snow” had the benefit of being distinctly rhetorical. Yes it was a hypothetical hazard, since we hadn’t seen snow in any quantity in England (Scotland probably a different matter) even up to the date I left. So really I didn’t think it was a serious risk and I didn’t worry about it. Well, over the last two days I’ve had the opportunity to consider what would happen if the “deep snow” scenario materialised. Because I’ve had it in bucketloads. And extremely big buckets, too. 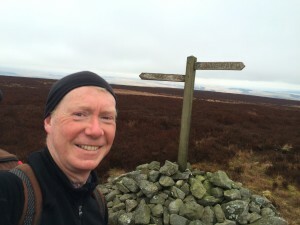 On the night before a “big” walk, I don’t tend to sleep very well, and today’s hike from Dufton to Alston, right across the spine of the very highest Pennines, was definitely a “big” walk. 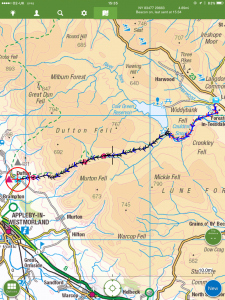 There are three of these “big” walks on my route – the Penyghent section, which I completed with Mike a few days ago, the Cross Fell section, today, and then the Cheviot section next Thursday. Of all the three walks, the one where I really didn’t want heavy snow was today’s – since the track spends a good ten miles of its length at high (for the UK) altitude. To make matters worse, after yesterday’s experience I wasn’t totally sure that if I encountered the same conditions again today, I would actually be able to make it to the end of the walk. It was a good eight miles longer and, a bit alarmingly, from an examination of the map, I couldn’t see any easy escape route off it, short of retracing my steps and returning to Dufton. After waking up every couple hours all night, and anxiously sticking my nose out of the window to see what the weather was doing, I eventually gave up on sleep and got up at about 6. 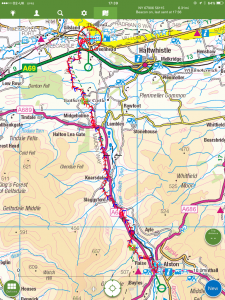 Over breakfast I started chatting to the three other guests in the B&B and was very glad to discover that they were also heading for Alston via the Pennine Way today, although were planning to complete it in nine hours versus my estimated eleven. 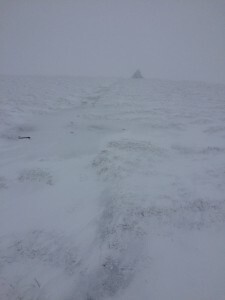 So I left as soon as I could, aiming to have the other walkers behind me at least until I reached the top of Cross Fell. I wanted to feel that if anything untoward should happen to me, I would have the comfort of “sweepers” following me. 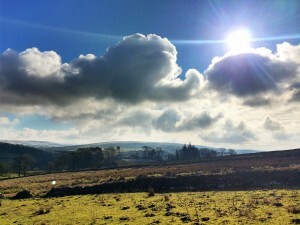 So I set off directly out of Dufton, climbing consistently up out of the Vale of Eden and into the high Pennines. The temperature fell rapidly as I climbed and to my delight yesterday’s slush started to freeze hard, so the going became a bit easier as I climbed. 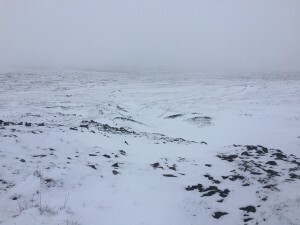 But the ascent of Knock Fell, the first of four summits on today’s Pennine ridge walk, was largely pathless and as I climbed, the snow cover became continuous and deep, and a heavy mist dropped over the landscape. In this whiteout world, it became impossible to judge scale and direction. Drifts which appeared inches high were waist-deep sinkholes, whereas other that appeared mountainous could be stepped over with ease. I also found it hard to tell up from down, except by the wearying force of gravity on legs and soul. The Cross Fell summit is completely featureless – at least it was today – and I relied almost totally on my GPS to get me to the top. I say “almost” because I did have another navigation aid. The wind had blown the ice into pointed drifts that faced into the air-flow. These sastrugi (a Russian word) were ready-made direction indicators – with the wind coming from the north east, I found that if I kept my boots at 45 degrees to the sastrugi I would be heading roughly north – the direction I wanted to go. 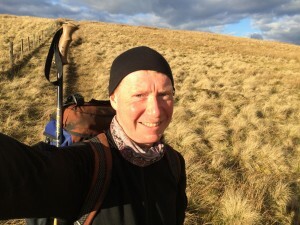 It took me five hours of solid slog to get to the summit, with only the briefest of stops on Knock Fell to replenish energy levels with a synthetic dextrose and caffeine gel bar. Pretty unpleasant but it put an instant and much needed zing in my step. The three walkers caught up with me at Cross Fell summit, as I’d hoped they would. 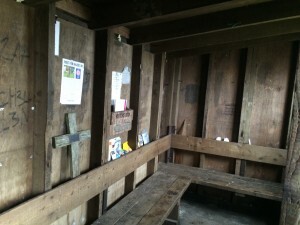 We walked together to Greg’s Hut, a remote bothy just to the north of the summit, and had a brief break for lunch. From there, it was a relatively straightforward slog down a track to the valley at Garrigill. By the time I reached the welcome sanctuary of civilization, I was pretty tired but still had another five miles to go to Alston. So I stopped briefly to eat my last sandwich, anxious to make the most of the twilight and reach Alston before nightfall. The remaining miles disappeared relatively quickly, despite being an unwelcome trudge through mud and farmyards. 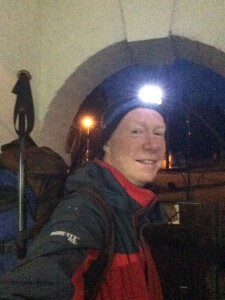 I made it to the B&B just after six, exactly ten hours after I set off – pleasingly, a full hour ahead of schedule. So now I’m thinking about tomorrow’s walk. 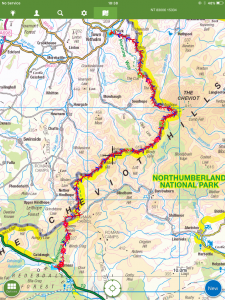 It’s an eighteen mile ramble along the side of the South Tyne river to Hadrian’s wall. Other walkers have told me it’s a “tedious” section and indeed I have no recollection at all of it from 1977, so it’s can’t have been very memorable. But after the last couple of days I reckon I’ve had enough excitement to last me at least as far as the Cheviots, so tedious is fine by me. Bring on the tedium! 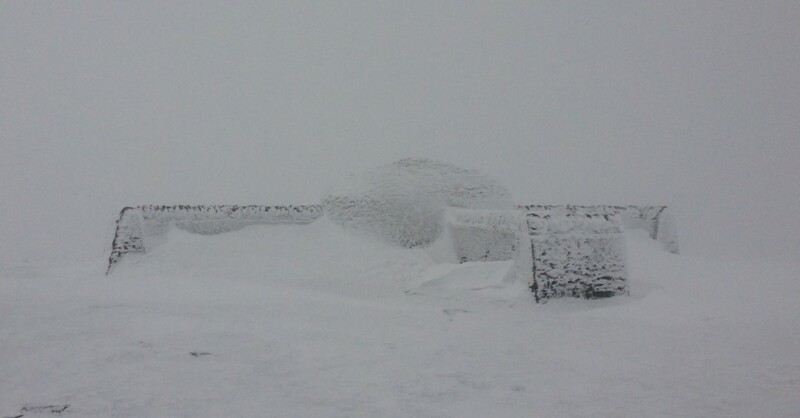 Curious summit cairn on Cross Fell. On the map it’s marked as a “shelter” and I wondered if the dome in the middle was some sort of hut. But I walked right round and couldn’t find any entrance – mind you the most likely entrance point was buried below a massive snowdrift, so I can’t be sure. Otherwise just a piece of interesting but essentially useless decoration! Today’s weather Heavy cloud, a couple of minutes of sun in occasional breaks. Heavy sleet and snow all day, blizzard at High Cup Nick. Strong north easterly wind, gale or severe gale at the top. Temp approx. plus 3C in the valleys, minus 3 at the top. Snow, slow, and splendidly spectacular. Normally when friends, passers-by and landladies offer helpful views about the weather, and how dire it is about to become, I disregard it, on the basis that it’s either better not to know, or it’s usually wrong. And over the last couple of days, I’ve been getting plenty. 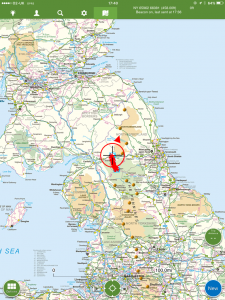 “The last person who attempted this section of the Pennine Way almost died. The mountain rescue found him a day later and he only survived because he sheltered in a hut. If it hadn’t have been for the hut, they would have been bringing back a body”. Well today, I had to rather grudgingly admit to myself midway through the walk, they did rather have a point. So far on this walk, I’ve enjoyed the Pennine Way in Gold and Lite flavours, and even managed to relish the challenge of the Classic sections. Well today was something entirely different. 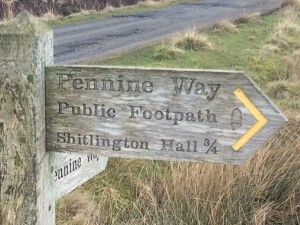 It was Pennine Way Max®. Yes, this was full blooded Pennine Way on steroids. I really enjoyed my stay at the Langdon Beck Hotel – friendly, cheerful and welcoming – and a lovely log fire. So I set off this morning in a good humour, looking forward – hopefully – to seeing High Cup Nick. 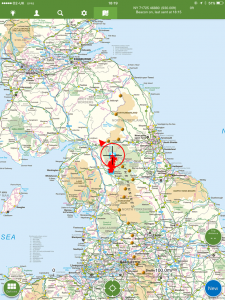 This is generally held to be the best section of the Pennine Way, with spectacular views over to the Lake District. In 1977, I’d completely failed to see anything at all, as I’d done this section in heavy rain and thick mist. The route in the early section of the walk, along the banks of the upper Tees was, in my view, the hardest and least enjoyable part of the day. The path, such as it was, stayed close to the river bank, and clambered over big awkward boulders, made Teflon-like because of their covering of wet snow. 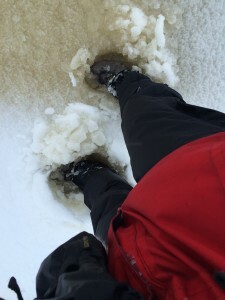 At this stage in the walk, although it was snowing hard, the snow was very wet – too warm to freeze properly, and when it settled, capable of absorbing at least its own weight in icy water. 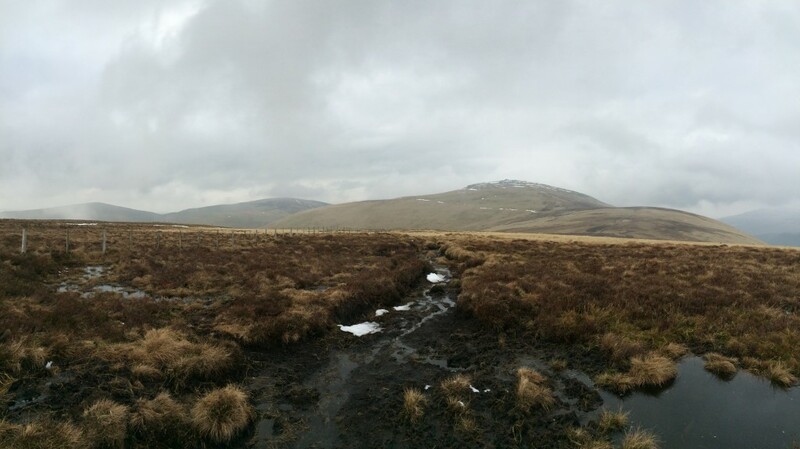 So within a few miles, my boots and feet were saturated – despite their multiple encasements of Gore-Tex. I soon reached Cauldron Snout (a waterfall, not a biological feature) and really enjoyed the rocky scramble up the side to the top. A fabulous, boiling cataract, with nobody there to see it except me. It was possibly my favourite of all the big falls I’ve seen on the Way so far – except of course for Hardraw, which I can’t comment on as I didn’t see it. 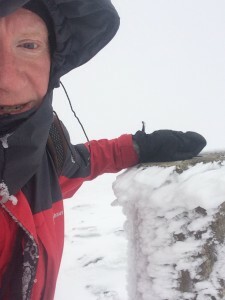 To my relief, once I’d climbed a bit higher to the top of Cauldron Snout, the temperature had fallen sufficiently for the snow to be a lot drier. So instead of sticking to me as they fell, the wind-blasted ice particles just bounced off me and around into the distance. There’s a good path from the top of the waterfall for a couple of miles, then it stops in seemingly the middle of nowhere. You are then well and truly on your own in the pathless wasteland until you pick up the track to Dufton, five miles to the west. 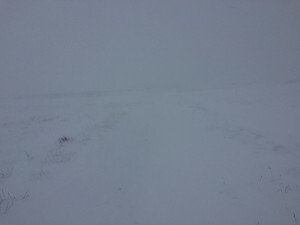 So I consulted my GPS, left the track, and plunged off into the snow. 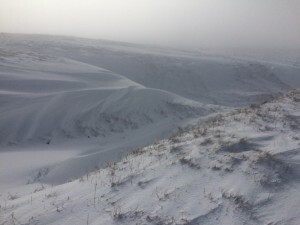 It was hard going, as the snow was lying in drifts one, two and sometimes three feet deep. On more than one occasion, I sank in waste deep and was only able to escape by flattening myself out on the surface, to spread my weight, then rolling over the snowfield until the snow became thin enough to hold my weight. I’ve come to learn that the more tired I get, the less hungry I feel, and the less I want to eat. 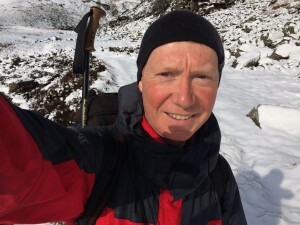 This can quickly become a vicious circle, and I recognised that as I was stumbling through the deep snow, I would be burning up energy by the bucketload and in danger of entering the downward spiral to exhaustion. 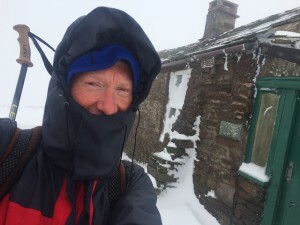 There was no real shelter up there, but eventually I found a snowdrift that afforded a bit of relief from the wind (which, incidentally, was coming from the east – a huge bonus as I had it on my back the whole way). I stopped briefly and ate all the calorific things I could find in my rucksack (which didn’t include salad, thank God) and then set off in the swirling blizzard towards High Cup Nick. As I got there, miracle of miracles! The sky cleared briefly, and I could just make out the stupendous, ice-covered, cleft in the hillside which forms the spectacular highlight of most Pennine Way journeys. It was majestic today, in its icy desolation, and for a moment or two, I could just see the distant hills of the Lake District, similarly blanketed in white duvets of snow. I didn’t hang around here, despite the splendour, as the wind increased to what felt like near hurricane force, and I could barely stand – and was acutely aware of the plunging precipice close to my left. The ground was frozen, so I couldn’t get decent purchase and I was worried that I might slip and that would have been that. To compound matters, the clouds closed in again at that point and the blizzard resumed with a ferocity that I’ve only encountered once or twice before in my entire walking career. I headed over to the north of the Nick, found a path, and dropped rapidly to Dufton. The vistas opened up as I fell below the clouds, revealing a large wintry plain, with pretty Dufton Pike standing out like a miniature (or perhaps oversized?) Roseberry Topping to my right. I made it to Dufton much earlier than I expected. I hadn’t walked fast over the top – it was impossible to do so – but I’d only stopped once, for a few moments, meaning I completed the whole journey in only just over six hours. 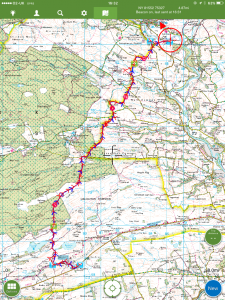 So now I’m going to dive in and have the hottest shower I can bear, then start planning for tomorrow’s walk, which passes over Cross Fell -the highest point on the Pennines and on the Way. It’s also a long day, over 20 miles, so I’m aiming for an early start. I am going to roll up my ears to any dire prognostications about how horrible tomorrow is going to be. 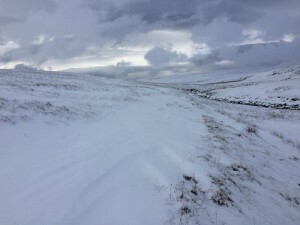 But I will be listening out for any signals that it’s going to be a bit colder than today, perhaps sufficient to convert the blanket bog of slush into a hard frozen carpet of ice, helping speed me on my way to my distant destination at Alston.